More info:From £1099 - £1299 excluding flights. Prices based on 2 adults sharing. Mimimum age 14. 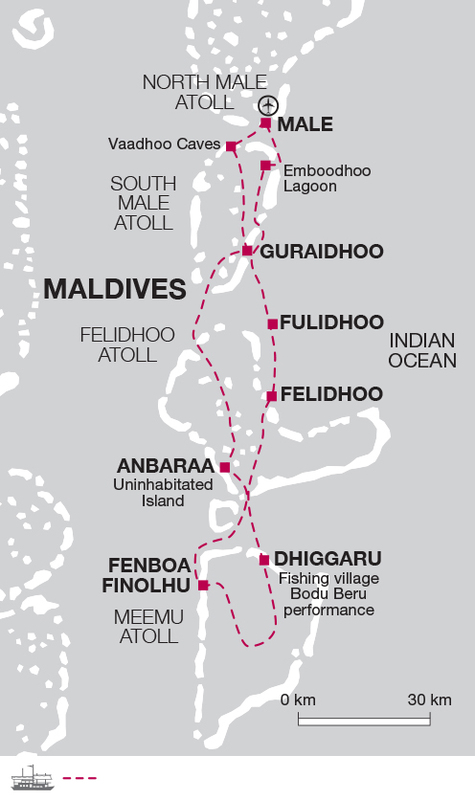 This trip avoids the large International resorts altogether, stopping at small local fishing villages on lesser known atolls to gain a genuine insight into the traditional Maldavian lifestyles away from the tourist industry. We sleep aboard a locally owned and operated converted traditional fishing vessel known as a “Dhoni” with all our food supplies being bought or caught locally, thus ensuring a direct contribution to the local economy of the islands. Limiting our group size to just 16 minimizes the impact of out visit – “smaller groups leave fewer footprints”Our boat crew and leaders have been trained to operate the Dhoni cruise in a manner to minimise our impact on the amazing coral atolls that form the focus of our snorkelling excursions from our boat.